I was able to follow two coyotes for about half an hour as they trekked through an urban neighborhood, crossing streets, over dirt paths and sidewalks and through yards, ducking into and out of hidden spaces — their pace and course were very purposeful. I didn’t see where they ended up, which might have helped me decipher what was going on, but the half-hour I watched clearly demonstrated their very keen awareness: their consciousness and knowingness and understanding. They knew how to follow the vegetation, logs or areas which might offer some protection. The coyotes sniffed and marked/urinated regularly as the terrain changed or when they veered into new areas. At one point, one coyote stood sentry for about five minutes, insuring the coast was clear in all directions before both took off through an area where dogs often congregate, but there were none today. But they also crossed into wide open areas such as streets — once stepping out of the way of a car but remaining in the street within about 10 feet of the car as it passed. Their awareness was keen for everything except cars. 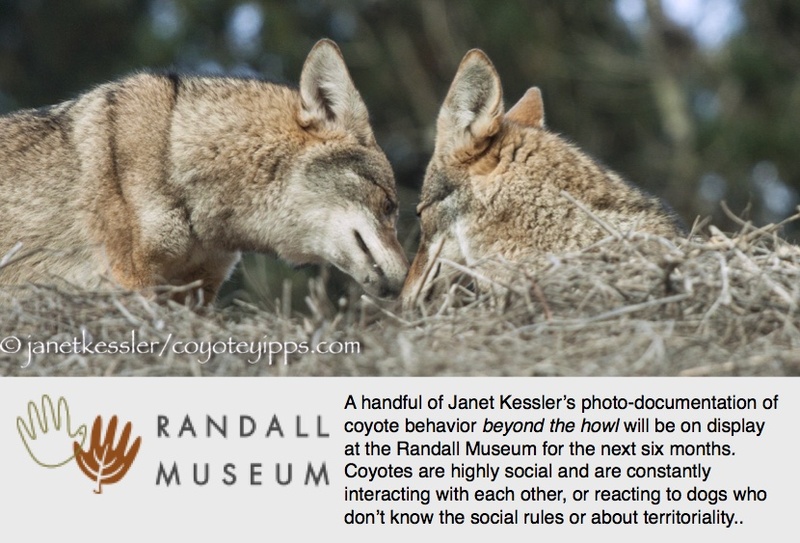 These coyotes were not just meandering around or hunting. They had a plan — a plan they had worked out. They knew exactly what they were doing and where they were headed. How did they know this, and how did they both know this? And how did they communicate this to each other? I have seen coyotes head out in this manner to certain lookout points in order to observe dogs and walkers from the distance — it is very purposeful behavior. But this time, these two disappeared from the main dog walking areas, so that could not have been their motive. Perhaps they had recently found a field full of gophers which they wanted to revisit? Anyway, the point is that coyotes can be very purposeful. They appear to be able to work out a plan and carry it out and communicate this, and deal with unforeseen interruptions along the way yet continue their plan. For instance, at one point a man saw them and threw stones at them. The coyotes veered off the path and circled around to avoid him — but they then continued in the direction in which they were originally headed. I have seen lions communicate hunting strategy and carry it out. The animals can communicate very effectively in subtle ways that we humans cannot pick up on. We humans aren’t quite smart enough to figure it out! We like to measure animal intelligence against our own — for instance, by how many word/symbols a chimp can manipulate. Wow — they can learn our language! Yet we haven’t been able to learn or decipher theirs! Very intriguing. I wish I knew where you where in this post….but then again, not really. It’s just so interesting to see the coyotes take to the open road!